We have a duvet cover on O's bed that just won't stay in place. As far as I can tell, the only bedding issue worse than having a duvet cover that won't stay in place is when your 3 year old's duvet cover won't stay in place because he wakes up cold and crying when the warm part slides down inside the cover and really, I can't explain to him how to fix it - I can barely fix it myself. So, thanks to some recent forced down time, I finally fixed the problem. Solution: Sew some ties inside the cover and some loops to attach said ties to on the comforter itself. This will be quick and easy but I took some pictures in case you want to do this yourself. It would have been infinitely faster if I'd used the sewing machine but someone needed me close by so I did it all by hand. 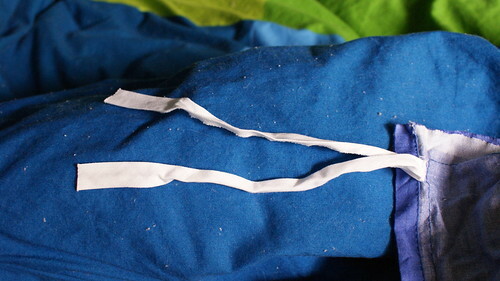 Step 1: Sew some bias tape or ribbon loops onto the edges of the comforter. I did 4 across the top and then one on either corner at the bottom. Step 2: Determine placement to match up with the loops on the comforter and sew ties to the seam allowance inside the duvet cover (in my case, I was missing a seam allowance at the top but it's just an Ikea cover so I just sewed it at the top crease). I used 16 inch long pieces of bias tape folded in half. 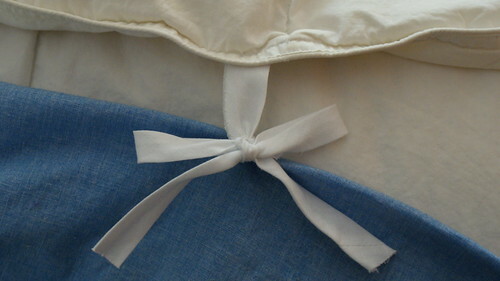 Step 3: While the duvet cover is still inside out, tie the top ties around the loops at the top of your comforter. 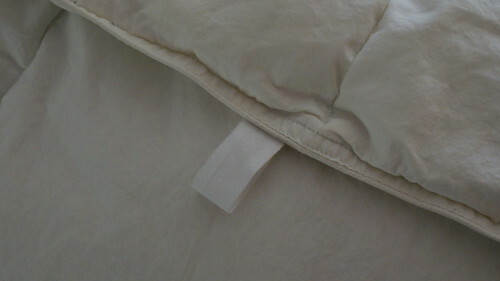 Step 4: Invert the cover over the comforter and tie the bottom corners in place before closing up the cover. Your cover and comforter should now stay together, no more slipping! Now I get it. Very useful, thank you much! Great for this sharing.Thank you so much. These steps really helpful for using a duvet.Thanks for sharing. Wow! That's so useful! Thanks for sharing. A simple tricks, yet not many people know it.